Generosity comes in many forms, and it’s often the best way for you to support important causes that matter the most to you in your life. 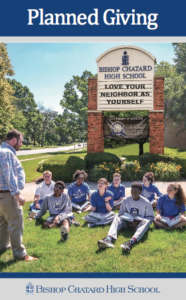 When you give to Bishop Chatard High School, you help us make a difference. Start here by learning the different gift options available to you. We will work with you to find a charitable plan that lets you provide for your family and support Bishop Chatard. For further discussion on Planned Giving, please contact Margaret Ruffing at mruffing@bishopchatard.org, or 317-251-1451 ext. 2242. This information is not intended as legal or tax advice. Bishop Chatard does not provide legal, accounting, or other professional services. Please contact your own legal and/or tax advisors for advice applicable to you.